Marshall M. Fredericks Sculpture Museum | Sketch for "Celestial Fountain"
Fountain" as a proposal for the 1939 New York World’s Fair. Although not selected for inclusion at the Fair, another Fredericks’ sculpture, "Baboon Fountain," did appear at the entrance to the Glass Industries Building, Flushing Meadow-Corona Park, New York City, in 1939. Drawing also includes sketches for "Harlequins (Clown Musicians), Ballerina & Orchestral Parade," "Don Quixote," "Persephone (Bacchante)," "Lovesick Clown (Pagliacci)" and "Clown Musicians". 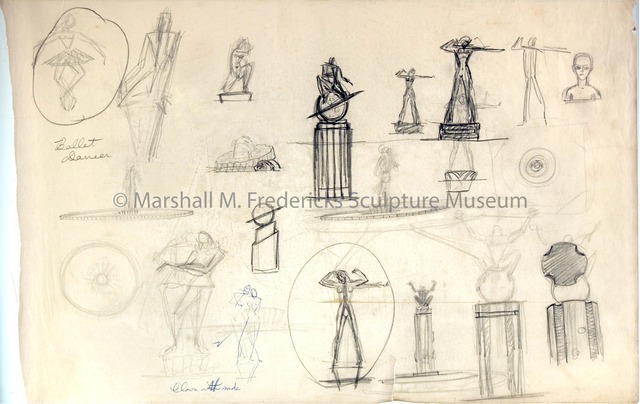 Fredericks, Marshall M., 1908-1998, “Sketch for "Celestial Fountain",” Marshall M. Fredericks Sculpture Museum, accessed April 20, 2019, http://omeka.svsu.edu/items/show/6253.